Dry rot is always a concern in extreme weather areas—ones which go from 100+ degree summers to foggy, wet winters. Weather such as this stresses building materials to create ideal conditions for dry rot development. Learning to take steps to prevent it, and catch it early if it does develop, can save homeowners time and money. Dry rot is a generic term for a variety of wood fungi, which cause mildew, mold, staining and decaying in wood. In order for dry rot to develop, it requires a certain combination of moisture and heat and air. If the conditions are right, it can occur before you can visually detect it, within four to six months. The reason that it becomes a problem is that infected wood loses its structural integrity. Once detected, this damaged wood must be totally replaced, or the fungi, will continue to spread and cause more damage. Dry rot can also attract pests such as termites, which only compound the problem. Repairing dry rot cannot be postponed, because as the damage increases, so does the cost to repair it. Where is Dry Rot most likely to develop? Dry rot can be found both inside and outside your home. The most common areas inside are the bathroom, under kitchen sinks, in window sills around sweating windows, in thresholds near sliding glass doors, in the attic from a leaky roof and in the walls, particularly in homes which have concrete slab foundations. Outside dry rot can occur in wood siding and trim, eaves of the roof, decks and other wooden landscape structures. Windows and doors are a prime location for dry rot due to improper flashing and caulking. Deterrent is always the best policy when it comes to dry rot. For more information, see our Caulking and Sealing services. Check the placement of your sprinkler heads to make sure there is no direct spray hitting your house. Make sure shrubs and plants next to the house don't touch the siding because they can hold moisture. Check around hose bibs to detect leaks. Check roof eaves for soft wood or a white powdery residue. 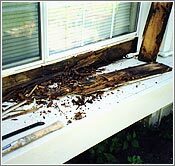 Dry rot maybe caused by improperly installed roof flashing, a roof leak, or you may need gutters. Around decks, look for earth to wood contact next to posts or any wood members and under potted plants. It's a good idea to treat decks with a wood preservative.